I love Martha Stewart. Every recipe I have ever made of hers has come out awesome. Seriously. I found this recipe a year or two ago and fell in love with it immediately. Now, I NEVER eat chicken thighs. I prefer white meat, with no skin, no bones and no “weird stuff.” So, it was a huge jump for me to even make this recipe initially… but I trusted Martha and gave it a shot. When I tasted that first try, I knew immediately that it was a keeper and would become a member of my treasured recipes. This is the recipe as it appears in her book, Fresh Flavor Fast. Following the recipe, are the tweaks that I made this time (this changes every time I make them). 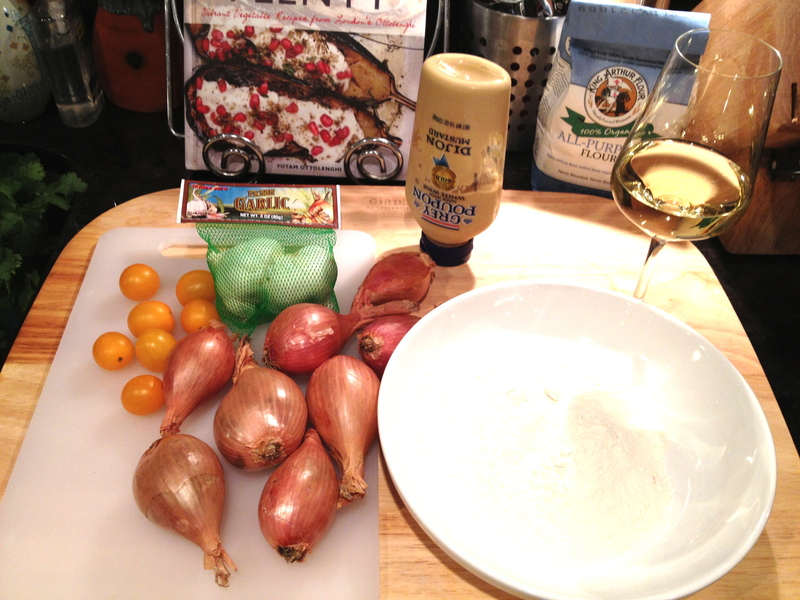 I am not one to EVER follow a recipe exactly… I like to add my own personal flair to it. 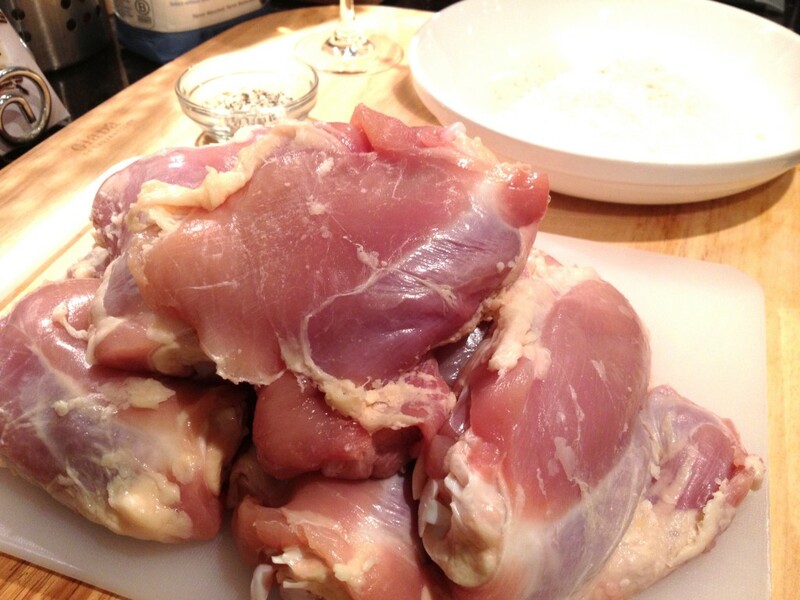 Season chicken with salt and pepper; coat with flour, shaking off excess. In a Dutch oven or 5-quart pot with a tight-fitting lid, heat oil over medium-high. 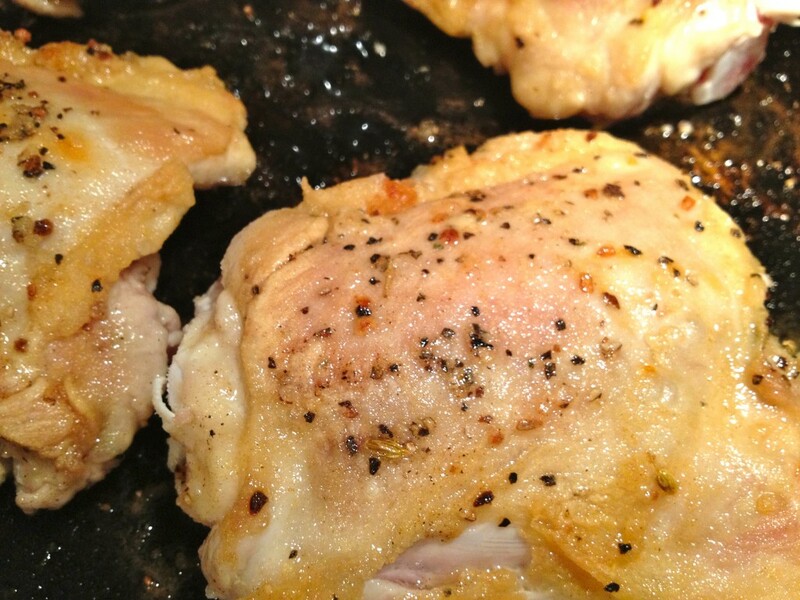 Cook chicken until browned, 3 to 4 minutes per side. Remove; set aside. 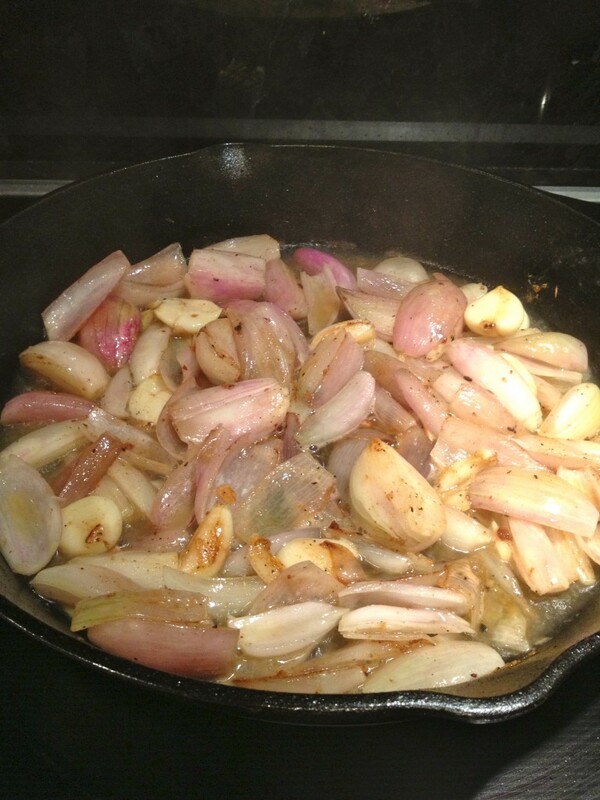 Add shallots and garlic; cook, stirring occasionally, until slightly softened and golden brown, about 5 minutes. Add wine; cook until evaporated, 3 to 5 minutes. Stir in mustard and 1 1/2 cups water; bring to a boil. Return chicken, bone side down, to pot. 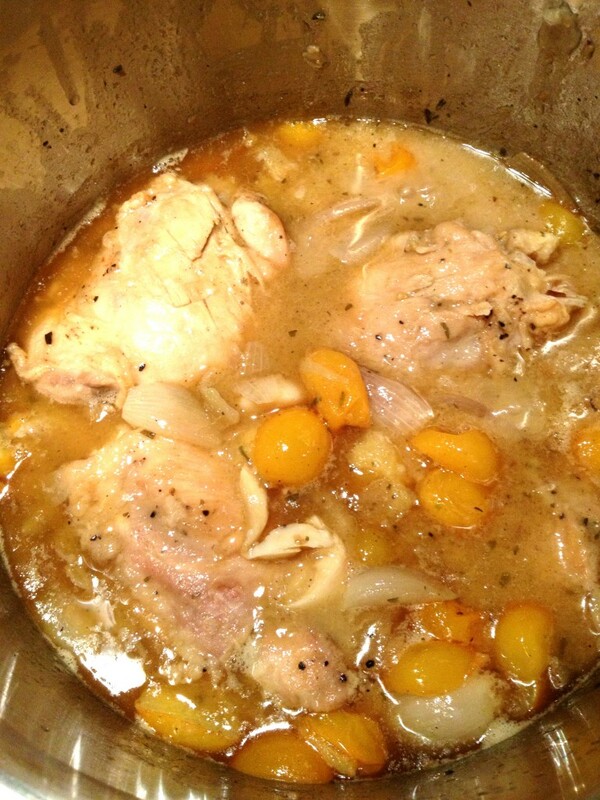 Reduce heat to a simmer, cover, and cook until chicken is tender and cooked through, 30 to 35 minutes. 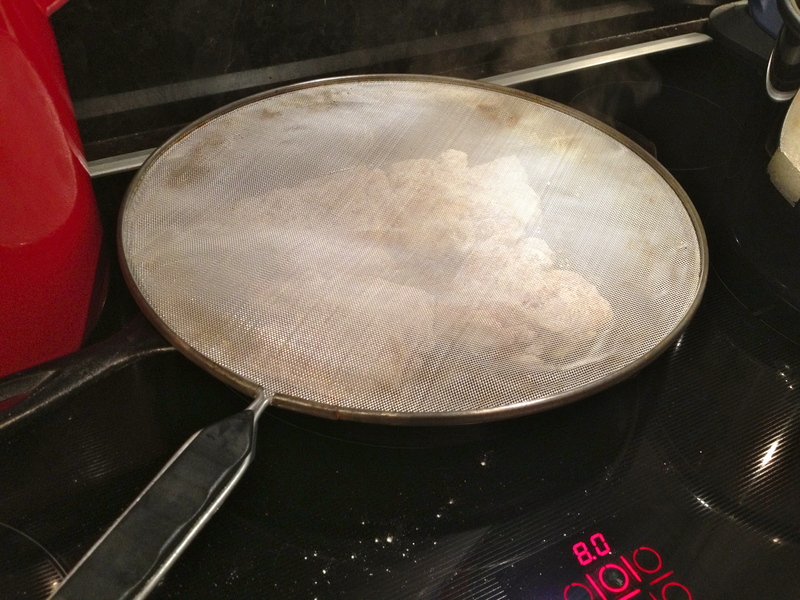 Transfer chicken to a plate; loosely tent with aluminum foil to keep warm. Add tomatoes to pot; season with salt and pepper. 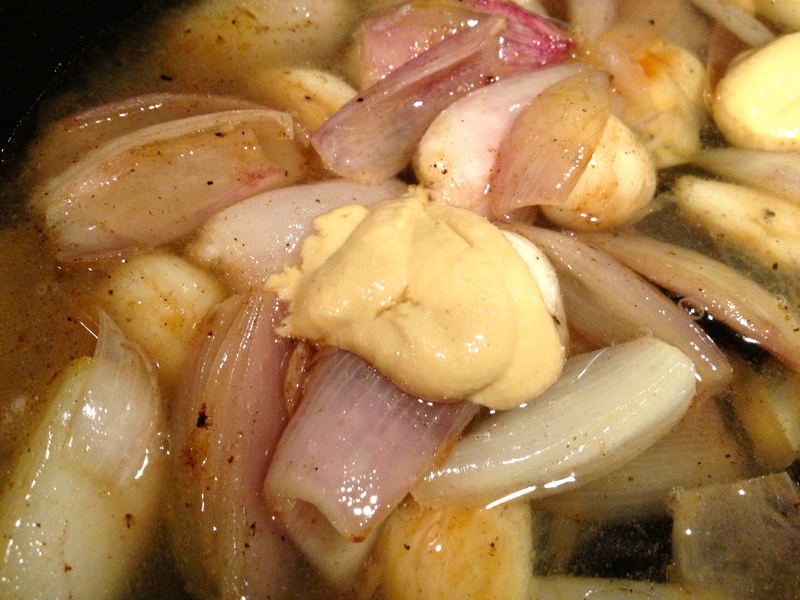 Cook on high until sauce has thickened, 6 to 8 minutes. 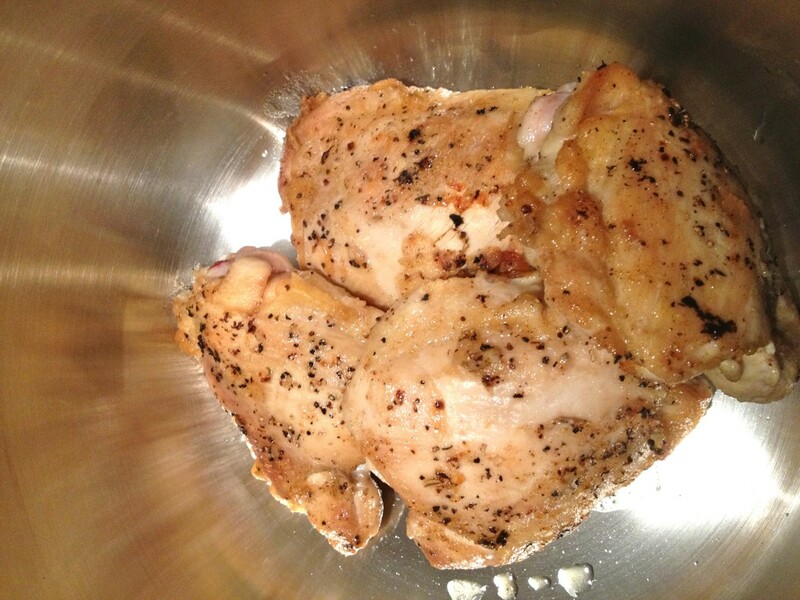 Reduce heat to medium-low, and return chicken to pot; cook until heated through. Serve, garnished with tarragon, if desired. 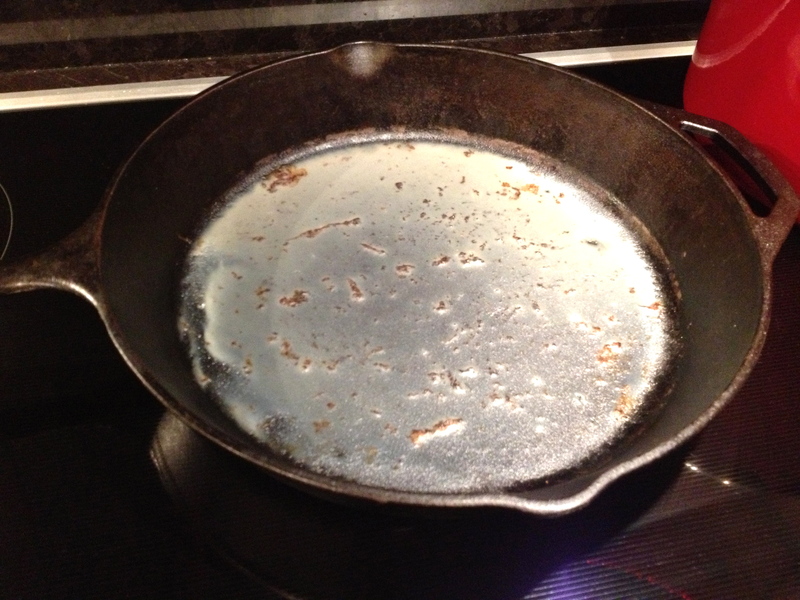 What inspired me to make the recipe this week, was the fact that my 7-yo son — who has most recently discovered the deliciousness of “pig” bacon as we like to call it (vs. turkey bacon) — had me make him some bacon this week and I still had the fat in my cast iron fry pan. Not wanting to let this go to waste… I pondered just WHAT could I fry in this delectable goodie?! I immediately thought of this recipe. Chicken, shallots, tomatoes, garlic and bacon fat? YOU BET!!!! The other change I made was using a sea salt blend to spice up the thighs, rather than just salt and pepper. 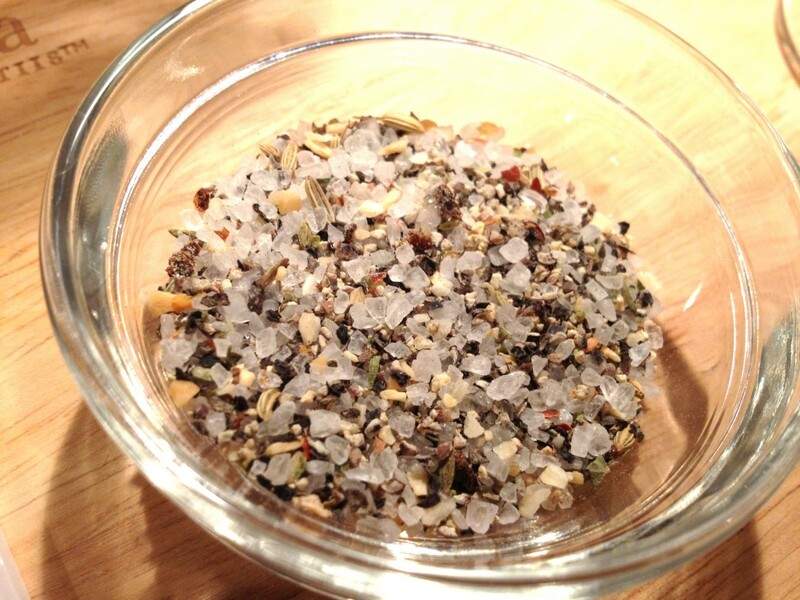 This is a “Garlic Pepper Seasoned Salt” mix. As you can see, it has other yummy things in it, like fennel seeds, hot pepper, etc. 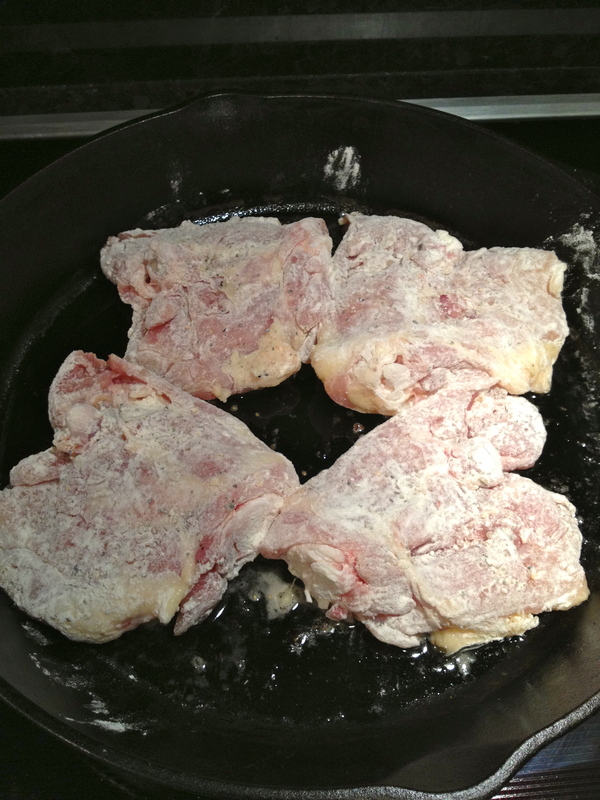 Once I skinned the thighs, I generously seasoned both sides with the salt blend, dredged them in flour and then added then to the hot bacon fat in my cast iron pan. The smell was divine! But, the chicken fat combined with the bacon fat was splattering all over the place, so I recommend using a splatter guard like this. I let each side go for about 4 minutes on a medium high heat. When I turned over the first batch, this was the result. Mmmm…. Once the first set was done, I transferred them to the pot I’d be doing the simmering in and braised the second batch. Sometimes I do ALL of the cooking in a dutch/french oven like Martha recommends. This time I wanted to utilize that bacon fat though, so I cooked everything in the cast iron and then transferred it all to a larger stock pot to simmer. 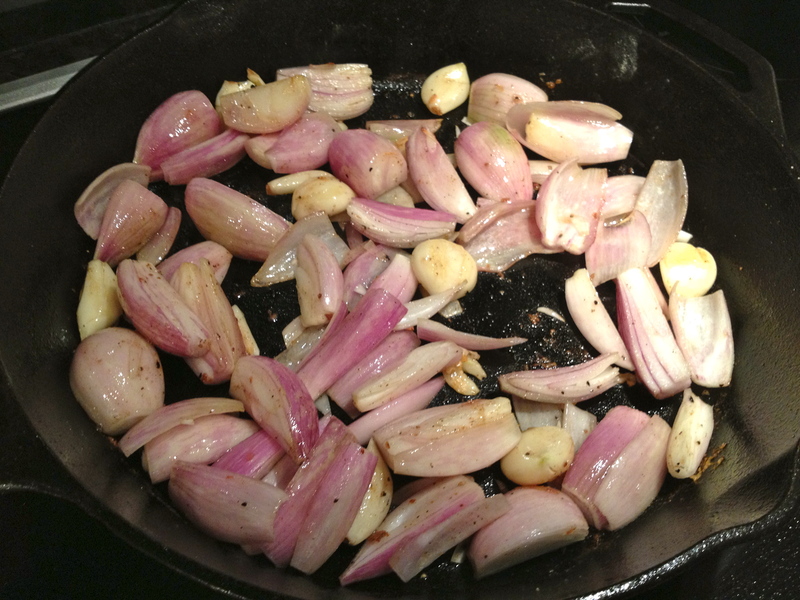 With the shallots and the garlic, I don’t really measure out. I just buy a bunch and use what I feel like. I almost always use more garlic than the recipe calls for and I also quickly smash it with the blade of a chef’s knife before tossing it in. I like that you get more garlicky flavor that way. Look how yummy they get as they caramelize (this was after I added the wine and water… so they aren’t quite as brown as they were before I deglazed the pan)! You really don’t need to measure out the mustard either. I happened to have dijon in a squeeze bottle, so I just guesstimate what 1 tablespoon would look like (times 3). This saves on dishes and will not affect the dish if you go a little over or under based on your tastes. Lastly, this is the book it came from. 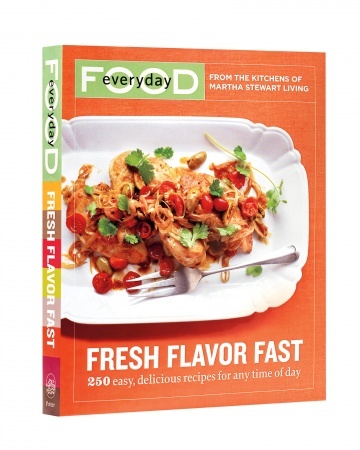 If you are looking for a book filled with fantastic recipes that are easy to make, buy this book. You won’t regret it.